Lego, the Danish company that specializes in toy building bricks, has showcased another project car which could make it to a production toy, based on the number of votes. 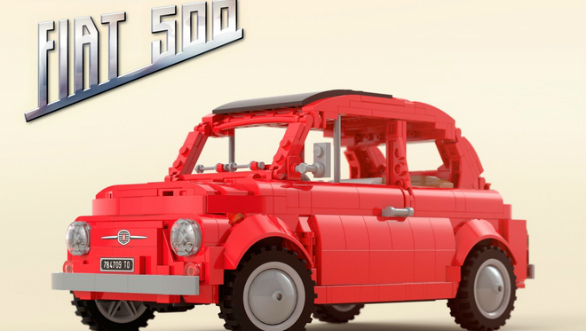 This Project Fiat 500 F, based on the car that was produced between 1957 and 1975, has been put up on the Lego Ideas website by one Saabfan. The website allows people to upload projects and share it with builders. The toy Fiat 500 consists of 1,157 pieces, with incredible attention to detail - stuff that we've seen in other Lego cars such as the Porsche 911 GT3 RS and Volkswagen Beetle. In fact, Lego has also approved the Caterham project, which means a new Caterham Lego toy will be out soon. That car too was up on the Lego Ideas website as a project, like this Fiat 500. The Lego Fiat 500 features a detailed exterior with neatly rounded edges. The doors, trunk and hood are openable. There's an openable sunroof too! The creator has also paid a lot of attention towards the interior. It features pedals, a handbrake, a dashboard and a speedometer. The seats tilt forward to liberate space for rear passengers, just like in the real car. There's a removable luggage rack at the rear which can be replaced with a suitcase. There's a toy glass and bottle of champagne inside it. A block of plastic represents the 500cc, two-cylinder engine at the rear. The detailed trunk has a spare wheel, toolbox, fuel tank and the car jack! While this Lego Fiat 500 may get enough votes, the only roadblock that could hold back production is licensing. Lego will have to work that out with Fiat, but it's not an impossible task. With the level of detail that's seen, this Lego Fiat 500 F makes for a valuable collector's item, especially for fans of the Cinquecento (Italian nickname of the Fiat 500). Watch the video of the car here.